If you haven’t been fortunate enough to meet Vanessa Collier and witness one of her head-turning, fiery, and passionate performances, you should definitely make sure you do. As a master musician and multi-instrumentalist, Vanessa Collier, weaves funk, soul, rock, and blues into every powerful performance and she is downright impressive. With soulful vocals, searing saxophone, and witty songwriting, Vanessa is blazing a trail, racking up an impressive arsenal of honors, and has already singled herself out as an artist of distinction and one we would all do well to watch. It’s not simply the accolades she has accumulated so far, although they’ve been many -- three Blues Music Award Nominations (BMAs), a Blues Blast Award nomination, the Jammingest Pro Award bestowed by the Legendary Rhythm & Blues Cruise, First Place for lyrics in the International Songwriting Competition, Best of 2014 Blues Breaker on Dan Aykroyd’s BluesMobile -- it’s the fact that she has accumulated all these honors even while her career is still in its infancy. A 2013 graduate of the prestigious Berklee College of Music, she’s toured nationally and internationally, released two critically acclaimed albums (2014’s Heart, Soul & Saxophone and 2017’s Meeting My Shadow), and released her highly anticipated third album, Honey Up, in July 2018. Honey Up spent 9 weeks atop the Billboard Blues Album Charts Top 15, 3 months on the Living Blues Charts at #10 and #23, and continues to be spun on Sirius XM’s B.B. King’s Bluesville radio station! As for Collier, she says she’s happy performing on stages across the world, hoping that she can make a difference with fans and followers along the way. “I am driven to do this because I find it a total form of expression and connection,” she explains. “I love connecting with an audience and feeling their energy and I hope to inspire people to follow their dreams and passions, to find what brings them joy, and then to pursue it doggedly.” Vanessa also takes that message to young people as she runs clinics across the country and is active with Blues in the Schools programs. At a recent Blues in the School program, Vanessa invited a stage full of elementary and middle school aged kids up to dance around her while she performed a blues shuffle. Watching the joy on the faces of Vanessa, the kids, and everyone in the auditorium, it is no wonder why Vanessa has become awe-inspiring to all who meet her. On top of talent and hard work, Vanessa shares an incredible heart and a strong purpose. To borrow from the words of an article in Blues Blast Magazine, “Vanessa is an important part of the future of the blues, and it would be cool to support her journey. 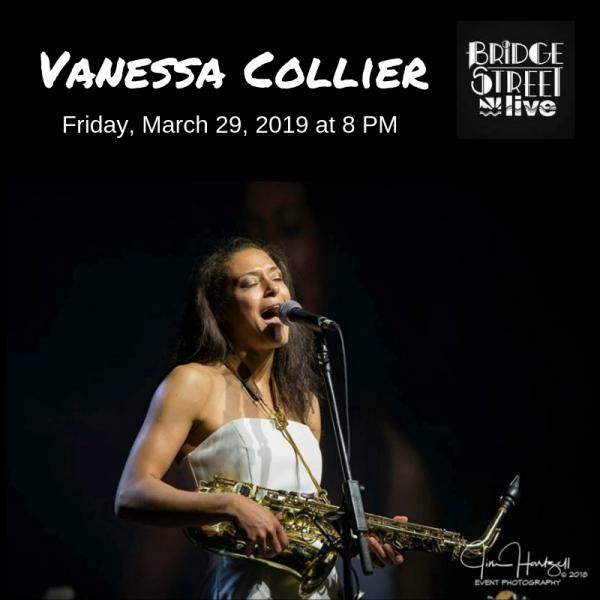 Tickets to see Vanessa Collier at Bridge Street Live are $15 for General Admission and $25 for VIP Reserved (plus fees).